Zog is a loveable, if somewhat clumsy dragon at Dragon School who is always striving to win a golden star. Zog is learning lots of essential dragon skills at school including flying, roaring, breathing fire and capturing princesses! 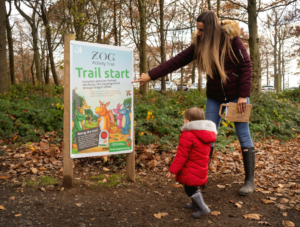 Forestry Commission England are now inviting children to step into the forest classroom to learn lessons just like Zog, including how animals fly, what sounds they make and how they catch their prey! As well as winning gold stars along the self-led trail, there will be reveal panels which have a hidden image that children can find using a coloured lens in their activity pack. Available to buy for just £3 the activity pack will also include a Zog mask, activity sheets a pencil and stickers.